Just finished a dreamy wedding at the Hummingbird House. 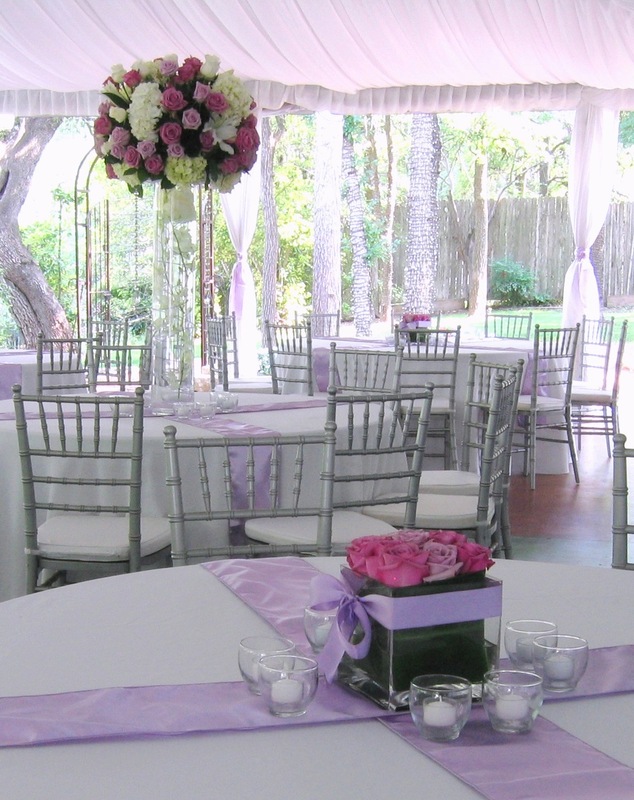 From flowers to linens to lanterns, lavender accents popped against the verdant green of the venue. The ceremony was held at the wrought iron gazebo. Several shades of lavender petals lined the aisle as silver chivari chairs with lavender bows stood ready to seat guests. 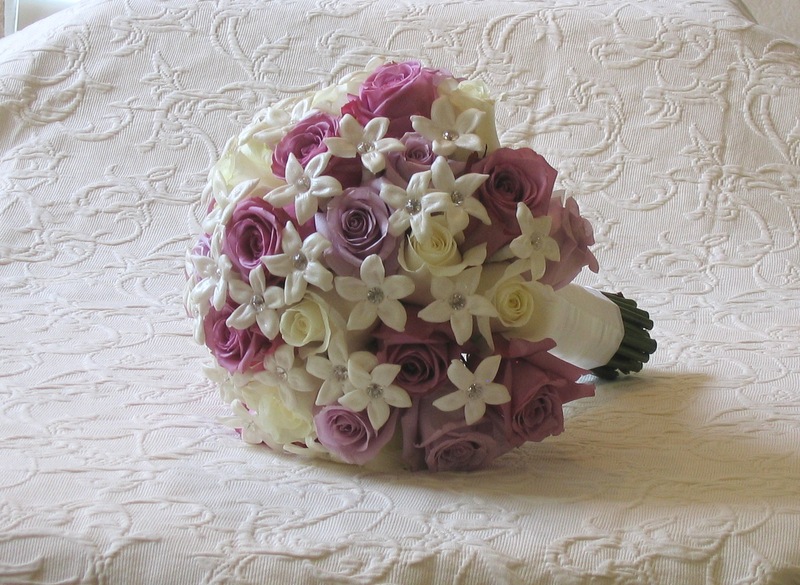 The bride carried a beautiful lavender and white rose bouquet, embellished with crystal-accented, white stephanotis. The groom wore a white guayabera (Mexican wedding shirt) and lavender boutonniere. The bridesmaid wore lavender chiffon while the groomsman wore a lavender guayabera and white boutonniere. After the ceremony, guests drifted into the cocktail area for a cool drink as music and laughter filled the air. As the evening progressed, glistening crystal chandeliers beckoned guests into the white tent, which was swagged and draped with chiffon, twinkle lights & silver accents. “Sparkle” was an understatement, as crystals dripped from ceiling to floor. 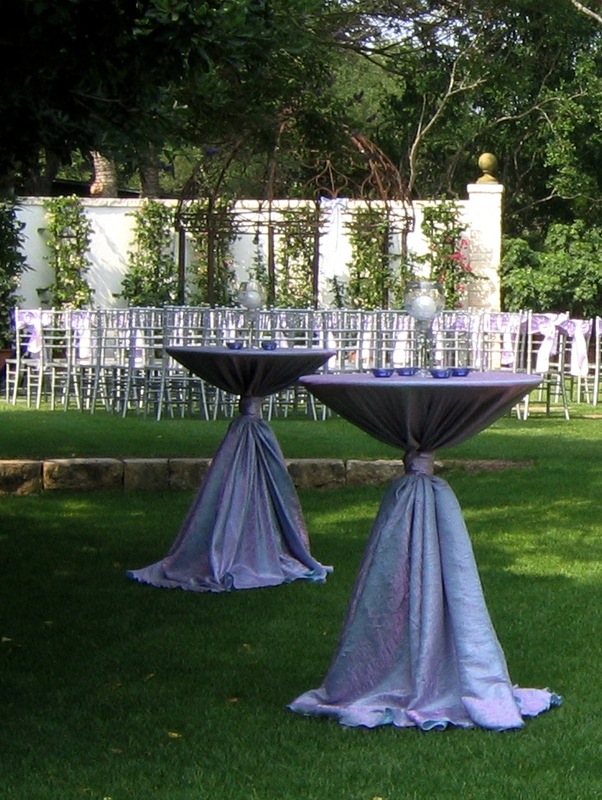 The round guest tables were dressed in white linens “sashed” with lavender. 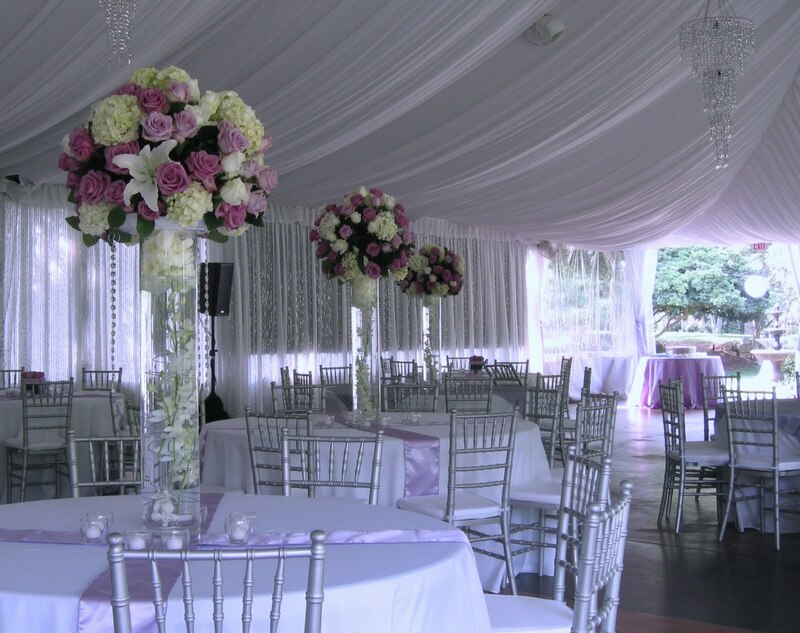 Half of the floral arrangements were over five feet tall and consisted of orchid-filled glass cylinders accented with orchid tinted wire. A large arrangement of lavender roses and orchid lilies sat atop these cylinders. The entire arrangement was then draped with Swarovski crystals. Beautiful. 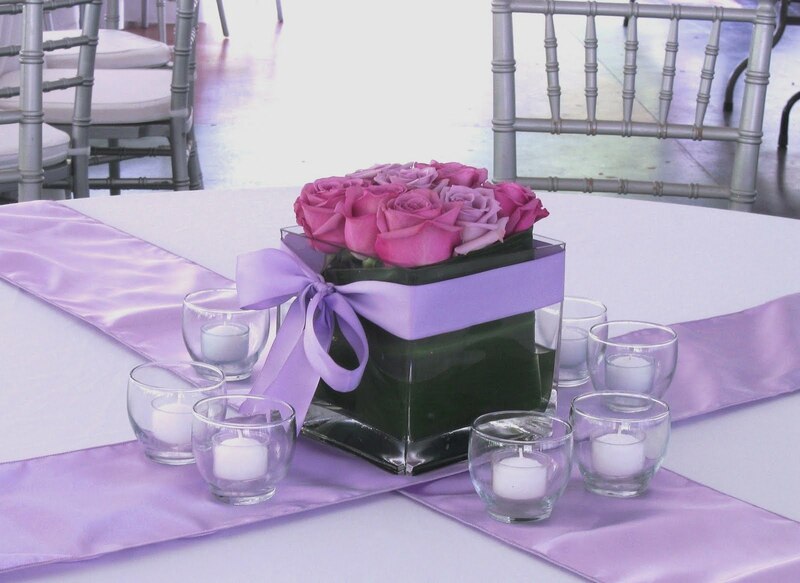 The second arrangement was a contemporary composition which consisted of a square glass vase accented with alternating bands of lavender roses, a ti leaf and a lavender bow. Did I mention that the bride LOVES bows??? All together, the centerpieces made for a very pretty composition. The groom’s cake was a divine chocolate/chocolate-raspberry creation. Between the cake and silver plateau was a thin crystal accent. Surrounding his cake were eight large square glass votives. Adjacent to his cake was a crystal tree with masculine ornaments, further accentuating the “crystal” theme. This was all displayed on a rectangular table, draped with lavender satin. The piece de resistance…the bride’s cake table. 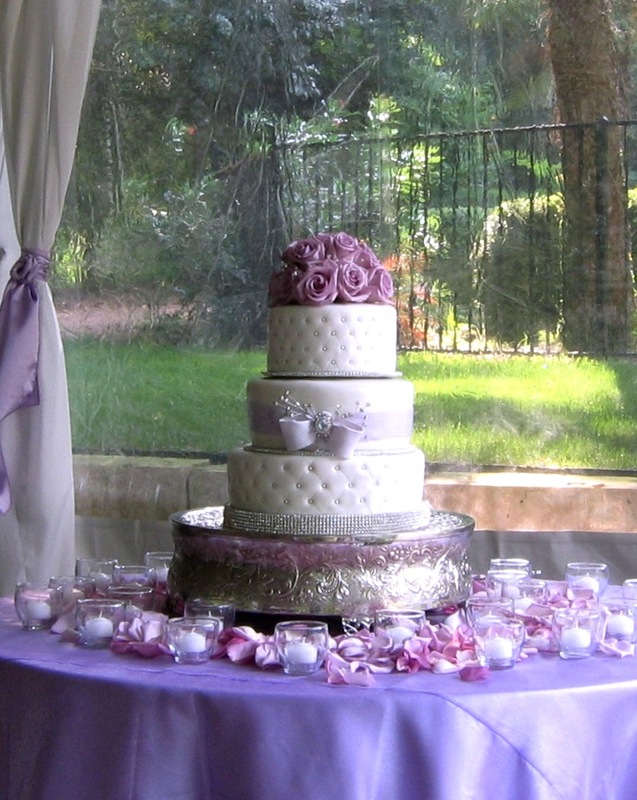 Chef Casey Rogers of The Brides Table created a delightful pale ivory/lavender confection. 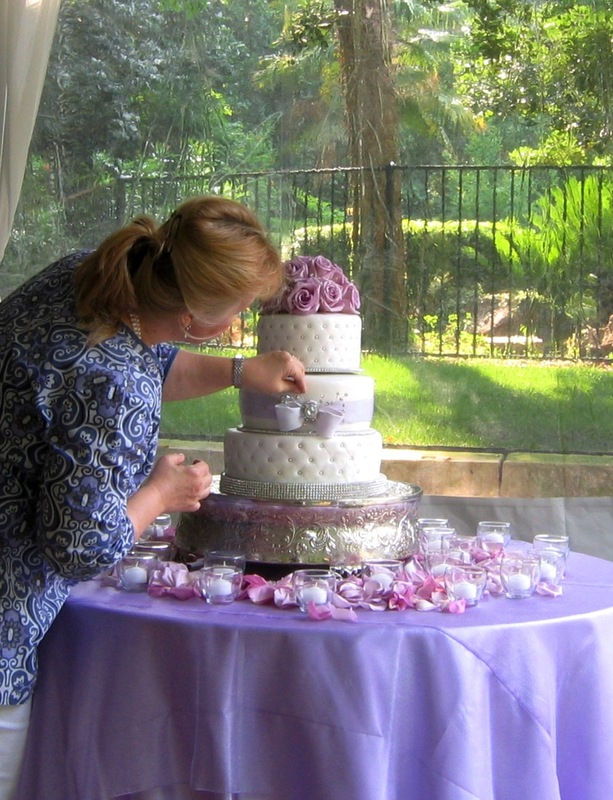 The top and bottom layers were quilted and decorated with silver dragees, while the middle layer featured a lavender fondant ribbon and, yes, a bow. But not just any bow. This bow had a large crystal in the center and was further accentuated with smaller crystals. The lavender rose topper by The Silver Vase was laced with the same crystals. (Yes, those are real, naturally-colored, lavender roses.). The top two layers sat upon slight crystal-accented plateaus, with the lower layer upon a heavily encrusted, pave crystal plateau. The cake and crystal plateaus were then placed upon a large, round silver plateau. Surrounded by lavender petals and votives the entire display was placed on a small round table, draped with lavender satin with organza.